The MA Architecture + Urbanism course is the Manchester School of Architecture's taught postgraduate course which conducts research into how global cultural and economic forces influence contemporary cities. The design, functioning and future of urban situations is explored in written, drawn and modelled work which builds on the legacy of twentieth century urban theory and is directed towards the development of sustainable cities. 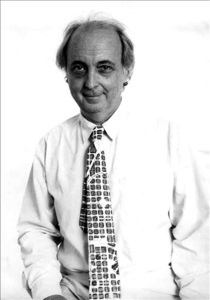 Manuel de Sola-Morales (1939-2012) was an architect and city planner, mostly dedicated to urban design matters. He was also a Catalan architect who came to prominence during Spain’s cultural and economic renaissance. The book is divided into three parts- theories, projects and selected writing. In addition, it comprises some theoretical writings by de Sola-Morales and others. And it also indicates a large amount of his work in practice between 1988 and 2005. The book is well illustrated but could benefit from a larger format/larger photographs. It traces the development of his ideas from a fairly conventional viewpoint to his own, individual and occasionally mischievous stance. For Manuel de Sola-Morales, the city did not consist of abstractions, but of concrete, tangible things. Urbanity, even dealing with a metropolis that is a node in world-wide networks of capital, people, commodities and ideas, is inextricably tied to materiality. Underlying the works presented in this book is an attentive, sensitive approach to the existing and potential richness of urban sites. His projects derived from an original observation of city spaces, and are meant to be reinterpretations and proposals for their transformation. They can be regarded as an urban architecture, at the interface of buildings and city plans. By transforming the physical reality at the scale of a building, an urban element, or sometimes with nothing more than the layout of a public space, Manuel de Sola-Morales operated changes that often transcend the physical or spatial dimensions of the intervention. de Sola-Morales's method offers a guide for an analysis of how the city, understood as a built entity, can impede or promote human behaviour and thereby affect the habitus of urban residents - now more than half the world's population. 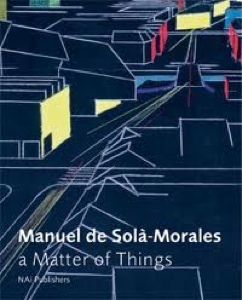 Manuel de Sola-Morales deviated from current professional practice in that he operated as the author of urban designs. He did not have a large firm, local authority department or consultancy behind him. He practised urban design the old fashioned way as a craftsman and thinker in his studio, the opposite of the bureaucratic and technocratic surroundings in which most urban design plans are created. As an architect he worked in a similar way, and would be unable to operate differently since he was a designer for whom the two disciplines of architecture and urban design are not just extensions of one another but merge seamlessly. In many of his projects it is impossible to indicate where one discipline passes into the other His architecture affected his urban design, just as his urban design always had an architectural component. The urban design approach to architecture is expressed in the way in which de Sola-Morales managed to de-individualize his buildings. As an architect de Sola-Morales and his work evaded the usual personality cult and he maintained a reticence and lack of adornment that have become rare today and which might be considered anonymous, but which should be regarded as essential if architecture is to be urban in the full sense of the word. The skin of cities is composed of constructions, textures and contrasts, of streets and empty spaces, of gardens and walls, of contours and voids. 'Bricks and mortar' is how the perspicacious geographer Maximilien Sorre defined the city. Plus movements and crossroads, vehicles and facades, basements and subterranean ducts. Shops, offices, empty building sites, apartments, museums, theatres and all kinds of empty buildings. Kerbs and pavements, warehouses and storage depots, factories and markets, monuments and ruins, stations, stadiums. It is precisely the contact between our bodies and these forms of physical matter that constitutes the urban experience. 'Flesh and Stone' is the title of one of Richard Sennett's most beautiful texts on the city. This is why the ramps and staircases, the gateways and corners are so important, because in them we feel with our weight the shape and size of the city. The projects of de Sola-Morales are divided into three different kinds of styles-to create a place (things invented, condensed form (things overlapping) and heterogenous accumulation (things in conflict). As there are geographical peripheries that have given rise to the term, so are there historical peripheries, places that time and memory have pushed to the margins of daily life. Sometimes, the urban unconscious masks the areas it does not want to recognize, because they are inconvenient, muddied and filled with conflict. And yet these zones can be absolutely central from a topographic viewpoint just as there are 'historic centres', places that history has considered central, there are also peripheries constructed by history. The project for Saint Nazaire 'Ville Port', drawn up in successive competitions and execution phases between 1994 and 1996, proposed a system of new guidelines in the port territory designed to involve the town and harbour in a new and more open, composite and active relationship. 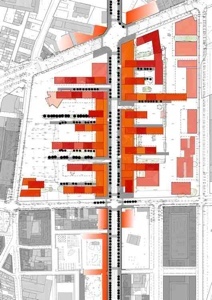 In the immediate surroundings the guidelines refer to the empty squares and parking lots between the centre and the submarine base; the ramp providing access to the roof of the bunker, with its incorporated hypermarket and housing; the 'atrium of the harbour' created in the transparent interior of the concrete cavern as space for a vestibule for exhibition halls, movie houses and restaurants. And, in the distance, at the outer perimeter that delimits the old German base, the towers both older and recent that rise above the harbour and the reinforcement of the avenues that skirt it, fuses the entire area into a structure that is both loose and strong. A structure of visual and functional relations that effectively mark a territory on the periphery, maintaining all the vitality of its industries (storage facilities, refrigeration plants, manufacture of fishing nets and moorings) mixed in with a few regional and civic functions of recreation, culture and commerce. In conclusion de Sola-Morales’s standpoint was one of humility and pragmatism. Architects have the capacity to add and enrich but not to solve. Architecture should not be heroic, ideological or about engineering society - a dangerous ambition. His approach is not about comprehensive redevelopment but surgical insertions. Where are we now, Number Six? Where are they now? Hi Five!